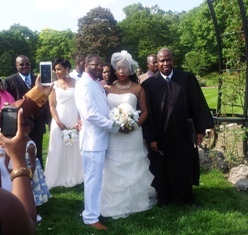 We specialize in helping couples transition into matrimony! I am a Justice of the Peace who possesses a passion for helping new people who are transitioning into one of the most important phases of their lives. I am happily married for over 35 years and have four children. I am currently the president of Jamakex International Co. Inc. DBA Hyde Park Business Center, Boston Massachusetts. 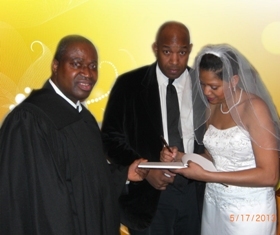 I have been providing Notary Public services for over 15 years and performing marriages for over 5 years. I have the great honor of officially joining so many couples in dignified and unique marriage ceremonies. Wedding provides a unique opportunity for families and friends to come together to celebrate. It is a special occasion that should be exactly what you and your family have envisioned it to be. I am committed to making the ceremony memorable. License can be obtained from any town or city hall within the state (3-day waiting period) and is valid for 60 days. Both partners must be present to obtain the license. Blood test or residency is no longer necessary. Witnesses are not required - the couple and the justice are sufficient. The couple can write their own wedding vows or the justice can provide several wedding vows. Wedding ceremonies can be performed at Justice's or convenient location within Boston. Outside Boston attract additional charges. Cost - The state has set the cost at $100 in the Justice's town, Boston and $150 elsewhere in the state. Additional charges - $75 per hour will be incurred for pre-marriage conference, developing and preparing the ceremony, rehearsal meeting, travel costs and other possible requirements. Deposit - A 50% non-refundable deposit is required at the initial meeting; balance, with license, is due at least three days before the ceremony. Late Fees - $50 late fee will be charged per hour. Member of Massachusetts Justice of the Peace Association, Justice of Peace Association of the U.S. (JPUS) & National Notary Assoc.